- New feature: Added PNG/JPEG compression for dynamically generated images (shapes, drawing tools, images with filters etc.). This makes it possible to optimize images for quality or performance (larger images look better but take more time to download and process). Support 10 levels. 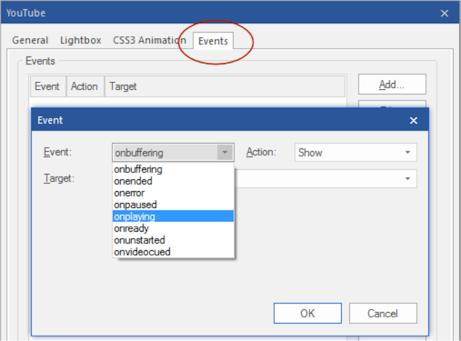 - New feature: Added support for Events and CSS3 animations/transitions. 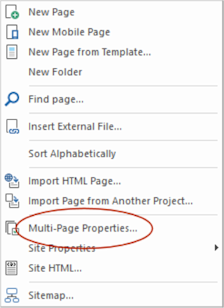 - New feature: Added Multi-Page Properties tool to modify selected properties for multiple (selectable) pages at once. 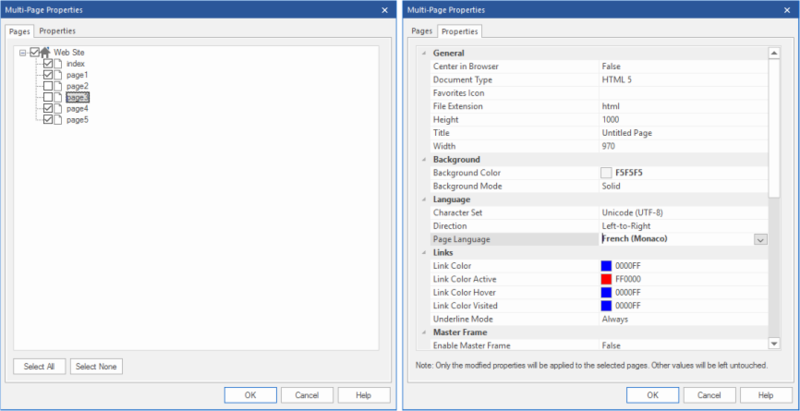 This makes it possible for example to quickly change the master page for a group of pages. But also, background properties, meta tags, page extension etc. Only the modified value(s) will be applied to all selected pages! - New feature: Added the ability to use semantic HTML5 tags. Tools->Options->HTML->Use HTML5 Semantic Tags. 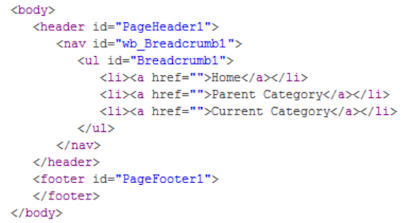 When this option is enabled WWB will automatically output semantic HTML5 tags instead of divs. For example, page header <header> page footer <footer>, navigation <nav>. - New feature: Added 'Move external CSS style sheets to the end of the page'. This is often recommended by Google PageSpeed Insights to improve the performance of the page. Note however that this also may affect the way to page is rendered because styles are loaded after the content has been load, resulting in flicker. Also some scripts may not support this because they expect the style to be between the head tags. Please read the help for more details! - New feature: Added 'CSS visibility property' (visibility vs display) HTML/CSS options. This option controls the way objects are hidden. When using 'visibility:hidden' hidden objects will not be visible but they still affect the layout (just like in previous versions of WWB). On the other hand 'display:none' removes the object from the layout so it no longer affects the size of the page. This can be useful when hiding objects that are not inside the page boundaries in breakpoints. - Improved: When using "enable responsive fonts" the text alignment is now also responsive, so you can have different alignments in breakpoints. - New feature: Text styles now display a style gallery with preview. To quickly modify a style, right and select ‘Modify’. - New feature: Add 'Create a style' option. 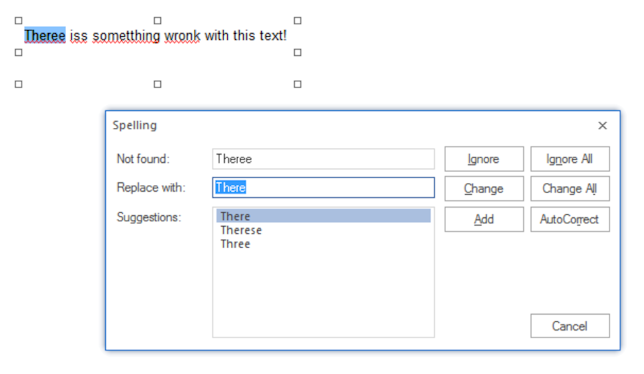 Create a style based on the formatting of the selected text. 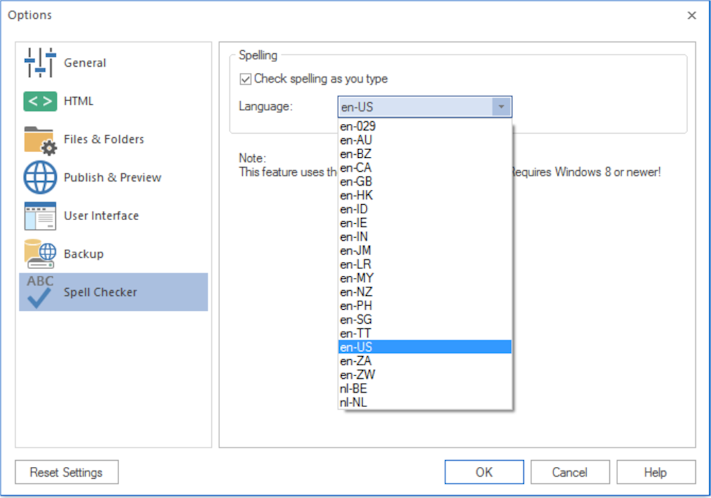 - New feature: Added support for native Windows spell checker. 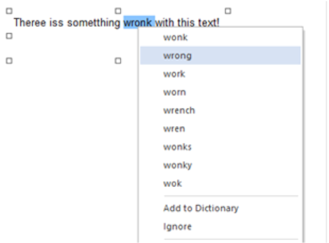 With 'spell as you type', 'Checking spelling' dialog (F7) and context menu suggestions. Supports all language dictionaries you have installed in Windows. Requires Windows 8, 8.1 or 10! - Improved: The sort tool now includes all data in the table. So, for example if you sort a column then the other columns will be moved too. Also, the style of the cells will be included, not only the text, so cells keep their own styling. - New feature: Added cell alignment options to the Ribbon and context menu of the table to quickly set the alignment of one or multiple table cells. - New feature: Added border-collapse option. The border-collapse property sets whether the table borders are collapsed into a single border or detached as in standard HTML. - New feature: Added the possibility to set the border-width of table cells. This replaces 'enable cell borders'. - New feature: Added 'Striped row color' option to add zebra-striping to the table rows. 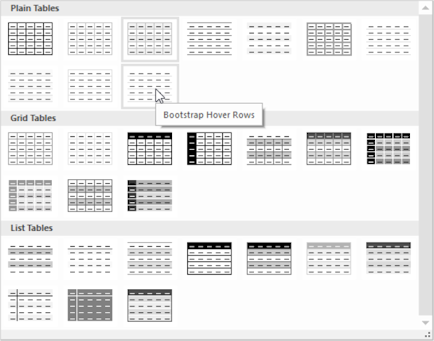 - New feature: Added 'Hover rows color' option to enable a hover state on table rows. - New feature: Added 'Header row' option. This will output the first row as header cells (<th> instead or <td>). - New feature: Added 'Table Styles' gallery. This allows you to quickly update the style of your tables. You may know this feature from MS Office. 30 predefined styles are currently available. - New feature: Added size mode 'Automatic' (in addition to 'pixels' and 'percentages'). When using this mode, the table cells will be automatically sized based on their content. This makes it possible to use a table in layout grid layouts. - New feature: Added 'Import data from text file'. A quick way to get data from a comma separated text file into the table. - New feature: Added the possibility to add objects inside table cells. When you drag an object inside a cell then it will automatically become an object container. Any text that was in the table cell will no longer be visible (until you remove the object again). Multiple objects can be inside a single cell and they will be floating, just like in a layout grid. Note however that tables are not meant to be used for layout purposes. 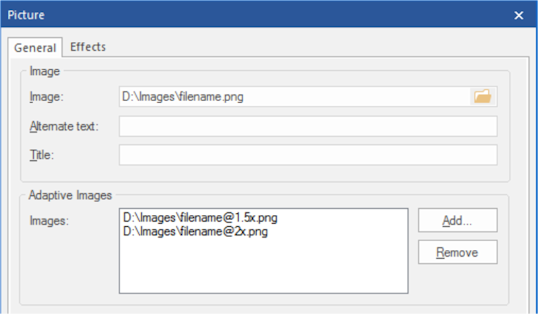 The main reason why this functionality was added is to make it possible to add images to the table. For example, as part of a list. 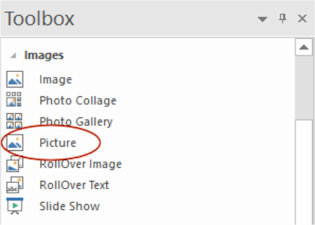 - New feature: Added 'Picture' object. The HTML5 <picture> element is a container used to specify multiple images for different viewport or screen resolutions. The browser will choose the most suitable image according to the current layout of the page and the device it will be displayed on. 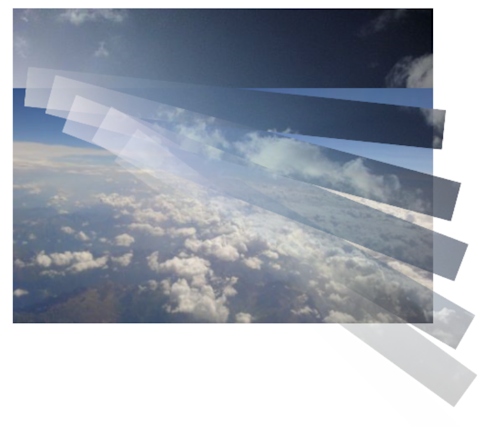 - New feature: Added 'Flip Horizontal' and 'Flip Vertical' animations (uses CSS3 transforms). - New feature: Added 'Fan' and 'Block Scale' animations. - New feature: Added animations to caption: fade, slide, rotate, scale, translate. - New feature: Added 'CSS3 animation' option. Select animations created with the Animation Manager. A different animation can be selected for 'show' and 'hide' to create sophisticated slideshows. 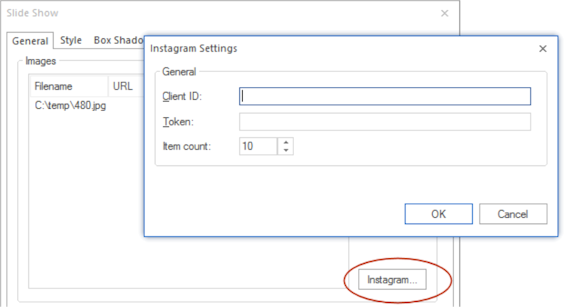 - New feature: Added Instagram integration. This makes it possible to feed the slideshow with images from your Instagram account. 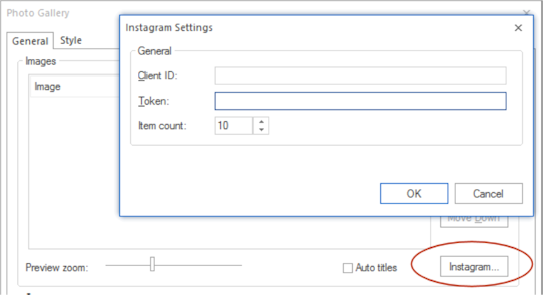 - New feature: Added Instagram integration. This makes it possible to feed the photo gallery with images from your Instagram account. - New feature: The Photo Gallery uses <figure> and <figcaption> tags when ‘Use HTML5 Semantic Tags (in Tools->Options->HTML) is enabled. - Improved: Now includes galleria 1.5.4, which makes it possible to use the lightbox/galleria in responsive layouts. - New feature: Added support for YouTube/Vimeo events (play, pause, ended etc.). Requires 'Enable JS API'. - New feature: play, pause actions in events can now be used to control the YouTube/Vimeo video. Requires 'Enable JS API'. 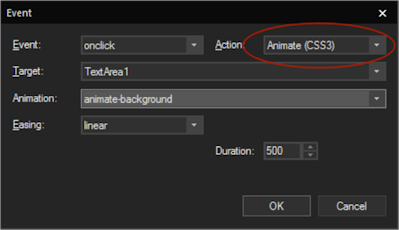 - New feature: Added 'CSS3 Animate' action. This will trigger a CSS3 animation from the animation manager. So, it's no longer necessary to manually create a separate style for this (WWB will do this automatically). 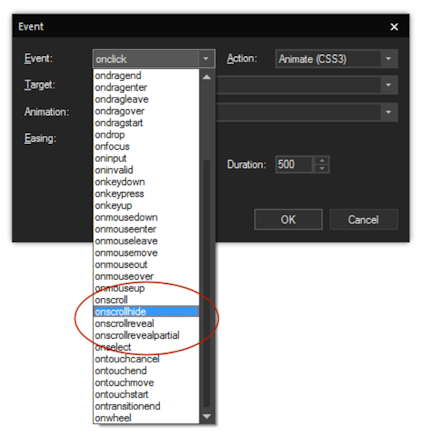 - New feature: Added 'onscrollreveal', 'onscrollhide' and 'onscrollrevealpartial' events to most objects. These events were previous only available for the bookmark object. - New feature: Added support for events to links in navigation objects: BreadCrumb, CSS Menu, Mega Menu, Navigation Bar, Pagination, Panel Menu, Responsive Menu, Slide Menu, Tab Menu, Text Menu, jQuery ListView and jQuery Menu. 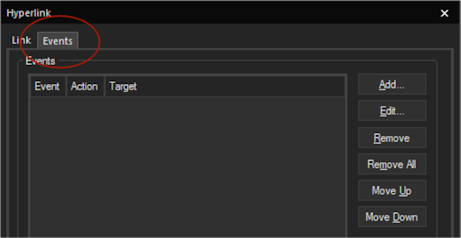 - New feature: Added the possibility to set the menu alignment. - New feature: Added ‘Full Width’ property so the menu can be stretched to the full width of its container (when used inside a layout grid). 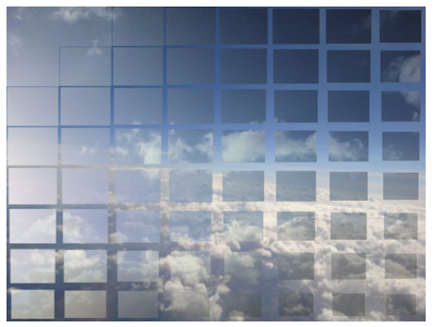 - Improved: CSS3 Transitions are now applied to the menu items (instead of to its container). For example, to rotate, scale or modify the style of an item on hover. - New feature: Added support for line styles: solid, dotted, dashed, double, groove, ridge. 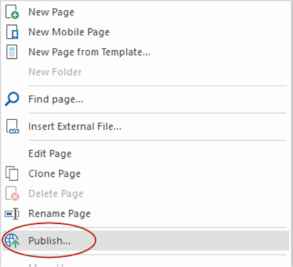 - New feature: Added "Publish' option to context menu in Site Manager, so you can quickly publish the selected page. 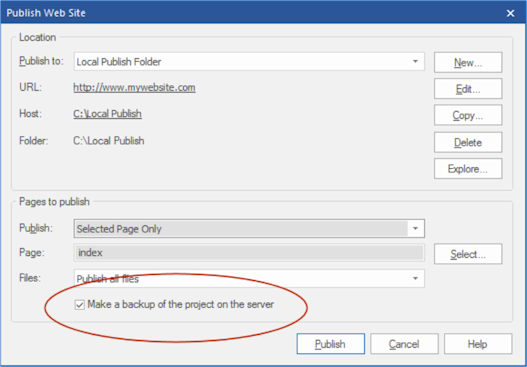 - New feature: Added ‘Make a backup of the project on the server' option to the publish dialog. This can be used to override the global setting for the current session.